Services and facilities: Every room is furnished with air conditioning, room to room phone, hot & cold shower, Western toilet & amenities, cable TV, beach & pool towels, hair dryer, coffee & tea making facilities, refrigerator with complimentary 2 bottles of drinking water, sundeck terrace, roof top garden (for the Garden Wingโ€�s guests only) and electronic in-room safety box. 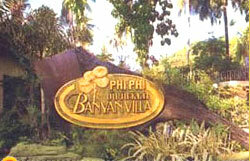 Phi Phi Banyan Villa provides 24-hour reception services and a free pick-up service from the main pier. Swimming pool opens daily from 08:00 a.m. to 08:00 p.m.
Tonsai Seafood Restaurant: The restaurant serves American Breakfast and accommodates a group-lunch package with Thai-Chinese cuisine. Enjoy dining on the beachfront with our wide varieties of fresh seafood as well as our delicious Thai, Chinese, and International cuisine. 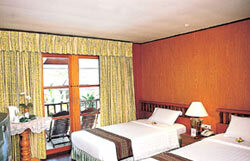 40 rooms of Banyan Style and 22 rooms of the Garden Wing style are tastefully decorated. 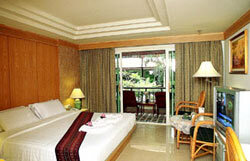 Each room has sea views looking out over Ton Sai Bay from the Terrace. The Rooms are comfortable and offer the following amenities. Safety deposit box, free of charge. Coffee, tea and cappuccino, free of charge. 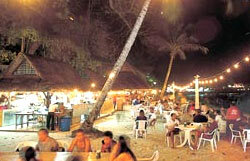 Close to the public beach.